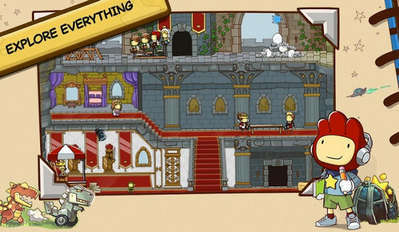 The world of Scribblenauts finally comes to Android in an all-new revamped version. 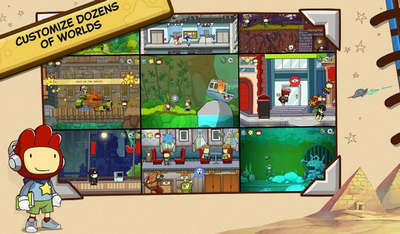 Scribblenauts Unlimited (Unlocked version 1.04) is somewhat like Minecraft (0.13.1) but with mischief. You try out new combinations and clever scenarios to solve unique puzzles. You create the world you want and get the outcome you desire! Scribblenauts Unlimited, as a sandbox game, gives you freedom to try out impossible creations and implausible deathmatches. There are no rules or boundaries except for your imagination. For instance, you can find out exactly who would win in a fight between God and Cthulhu!! You can spawn a giant rainbow beaver, or a shy, fire-breathing, winged hamster, or Tom Jones, riding a tiny helicopter made of ice. Creation is your field in this game and, let your imagination go wild! - All New Unbound World: Explore an open universe with unlimited hours of fun using every level as your playground. - Mobile optimized controls: Pinch-to-zoom and two-finger pan around enormous playgrounds. Interact and modify any object on screen. - Exclusive, new characters: Enjoy a time mashup with Hipster Lincoln or Robo-Einstein, become a Corporate Werewolf, or rule from above as Queen of the Skies! Install Apk, copy extracted sd data folder ‘com.wb.goog.scribblenauts3’ to sdcard/Android/obb/ and have fun.